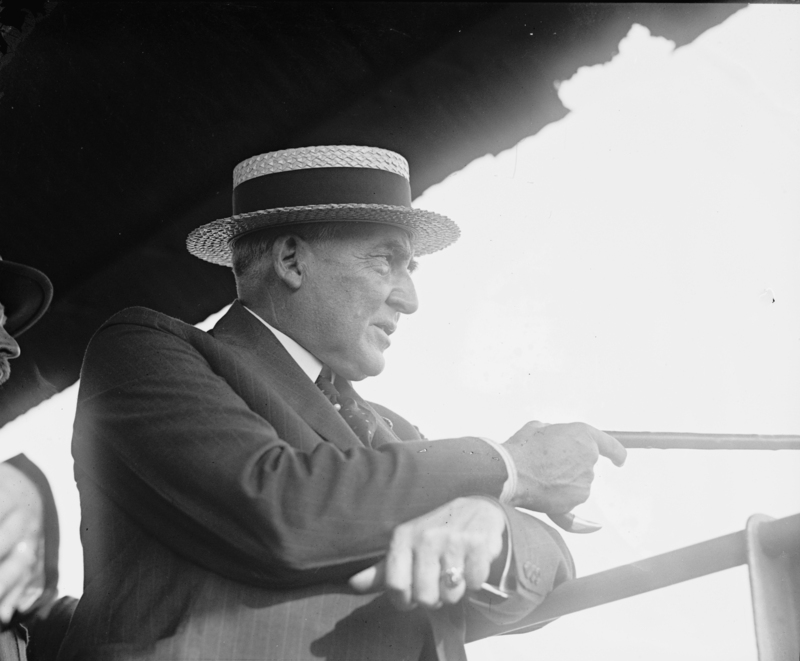 President Warren G. Harding (1865-1923) traveled to Gettysburg in 1922 on his way to visit his home in Marion, Ohio. He stopped at Gettysburg to watch approximately 5,500 members of the United States Marine Corps reenact “Pickett’s Charge.” Along with other dignitaries, Harding watched Pickett’s Charge from the top of the Ziegler’s Grove Observation Tower on Cemetery Ridge. Although he would be dead a year later, he was healthy enough at Gettysburg to climb the tower. Here he is pointing out the action from the top of the tower. This view, courtesy of the Library of Congress, was taken facing southwest in the late afternoon of Sunday, July 1, 1922. 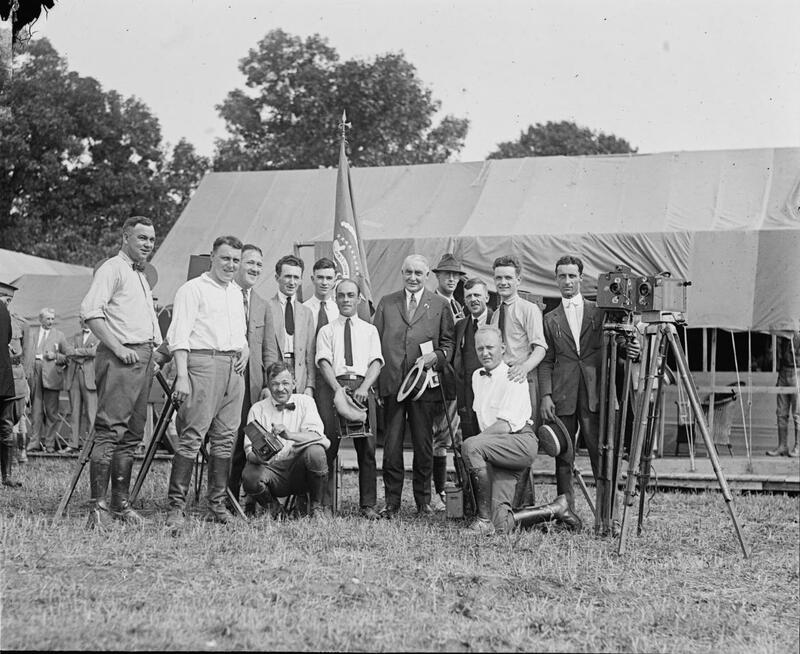 President Warren G. Harding visited Gettysburg from July 1-2, 1922. Today we will show you some photographs that document his visit to the battlefield. 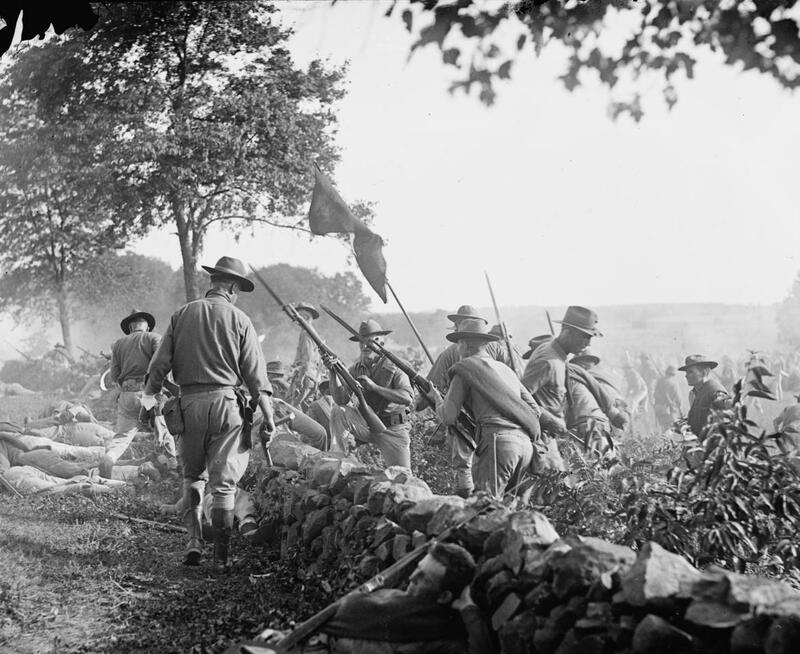 The Marines participating in the Gettysburg ceremonies included those from the 5th and 6th Marine Regiments. Although the 5th and 6th Marines had fought in France in 1918, these units were deactivated in 1919. 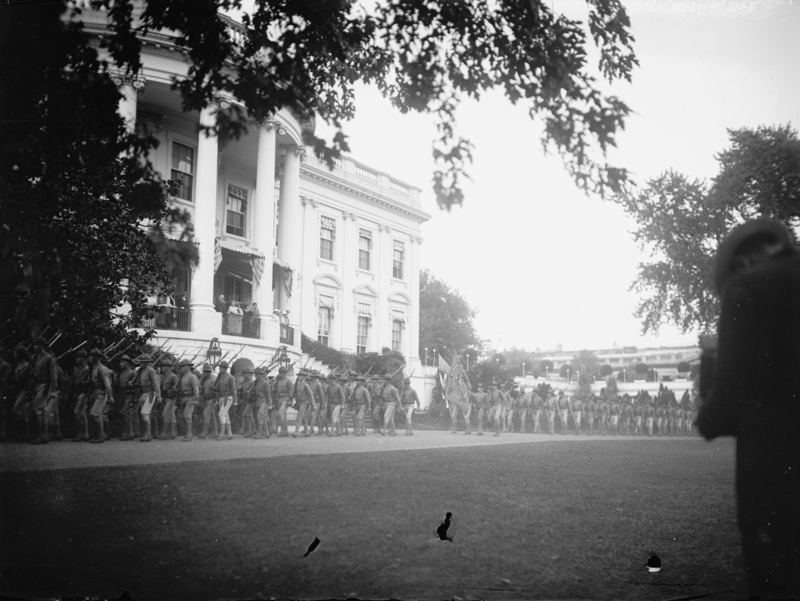 The regiments were reactivated in 1921, and a year later they would march to Gettysburg from Washington, D.C. 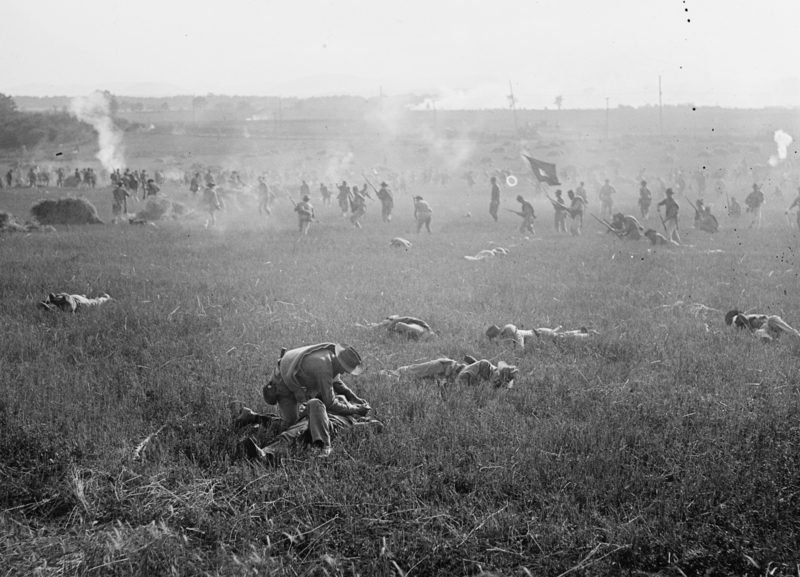 It is not known how many members of the regiments charging across the Pickett’s Charge fields in 1922 had fought in France in 1918. 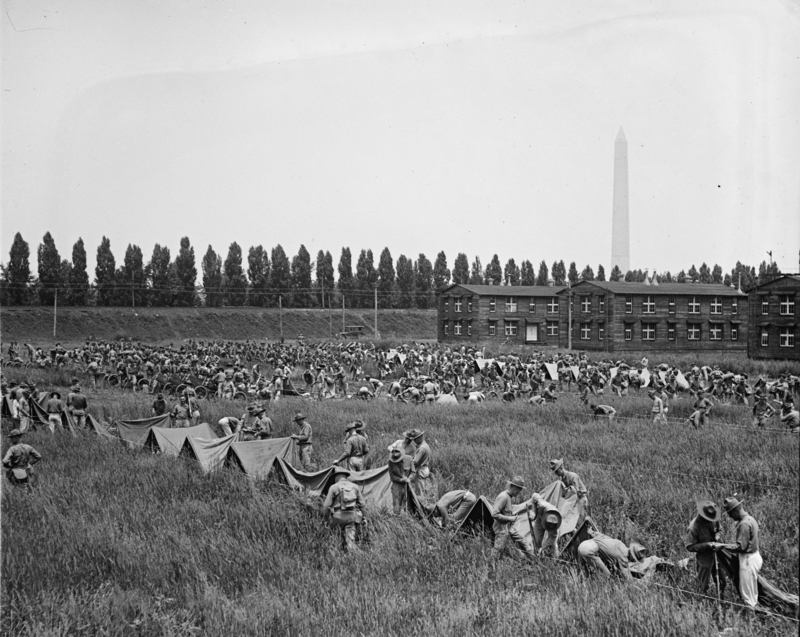 This photograph shows the Marines striking their tents and packing their gear for the march to Gettysburg on June 20, 1922. The Washington Monument is in the right background. This view, courtesy of the Library of Congress, was taken on the morning of Thursday, June 20, 1922. The Marines then marched to the south side of the White House to pass in review in front of President and Mrs. Harding. This view was taken facing northeast the morning of Thursday, June 20, 1922. 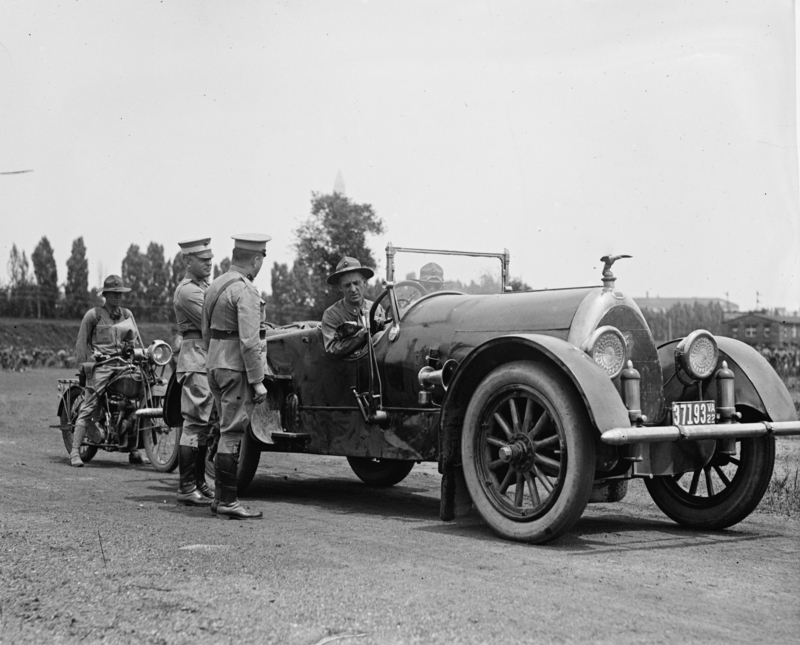 Brigadier General Smedley D. Butler (1881-1940) (seated in the car talking to the two standing officers) was at the time of his death, the most decorated Marine in United States history. By the end of his career he had received 16 medals, five of which were awarded for heroism. He was one of 19 people to twice receive the Medal of Honor. After World War I, he became Commanding General of the Marine Barracks at Quantico, Virginia. At Quantico, he was told by a local farmer that Stonewall Jackson’s arm was buried nearby. Butler dug up the arm, replaced the wooden box with a metal box, and reburied the arm. He left a plaque on the granite monument marking the burial place of the arm. The plaque is now at the Chancellorsville Battlefield Visitor’s Center. Butler directed the growth of Quantico until it became the “showplace” of the Marine Corps. He won national attention by taking his men on long field marches to conduct reenactments, and to show the nation how advanced the Corps had become in technology. That is why his men were marching to Gettysburg in 1922. This photograph shows Brigadier General Butler at the Marine camp in Washington the day before his men began their march to Gettysburg. 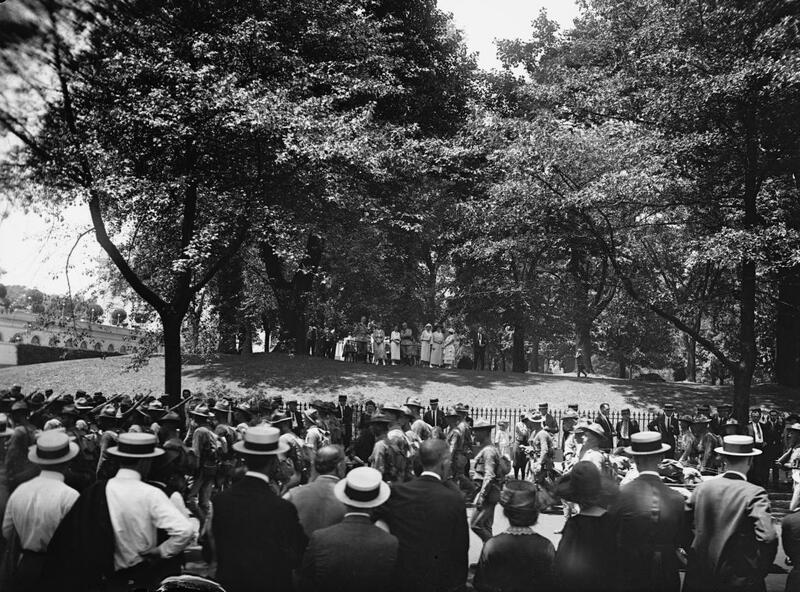 This view was taken on Wednesday, June 19, 1922. While Smedley Butler would drive to Gettysburg, his men hadn’t yet reached the point of becoming “mechanized infantry.” While some of his men would arrive in Gettysburg in tanks or airplanes, most of them traveled by foot. 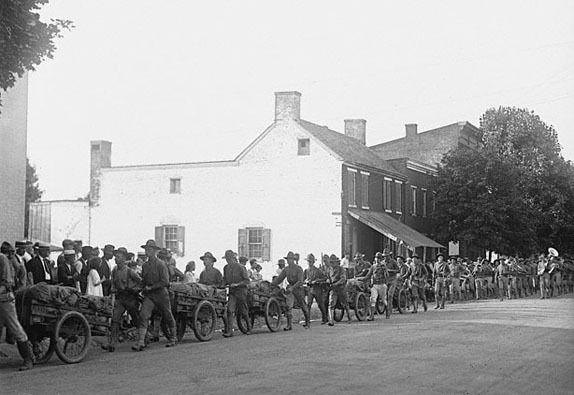 Here they are marching through Frederick, Maryland, on their way to Gettysburg. The marines arrived in Frederick around noon on June 24, and camped on the fairgrounds there overnight. They even had their band(s) playing as they marched through the town. This view was taken on June 24 or 25, 1922. 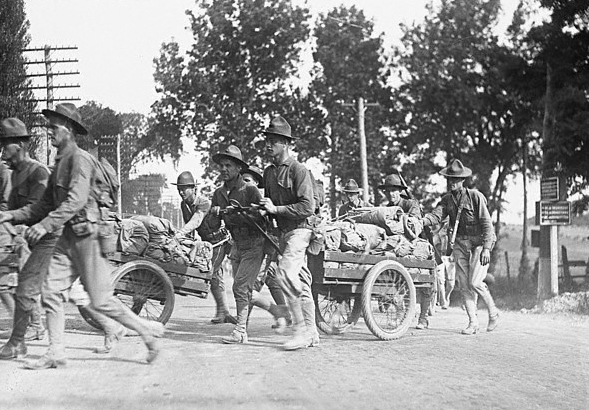 If there had been veterans of Belleau Wood and/or the Meuse-Argonne offensive on this march, how many of them do you think would have been happy pulling carts filled with their equipment from Washington to Gettysburg? One of the goals of the march was to see how these carts would work for the Marines. If successful, it was hoped that the Army would also adopt them. 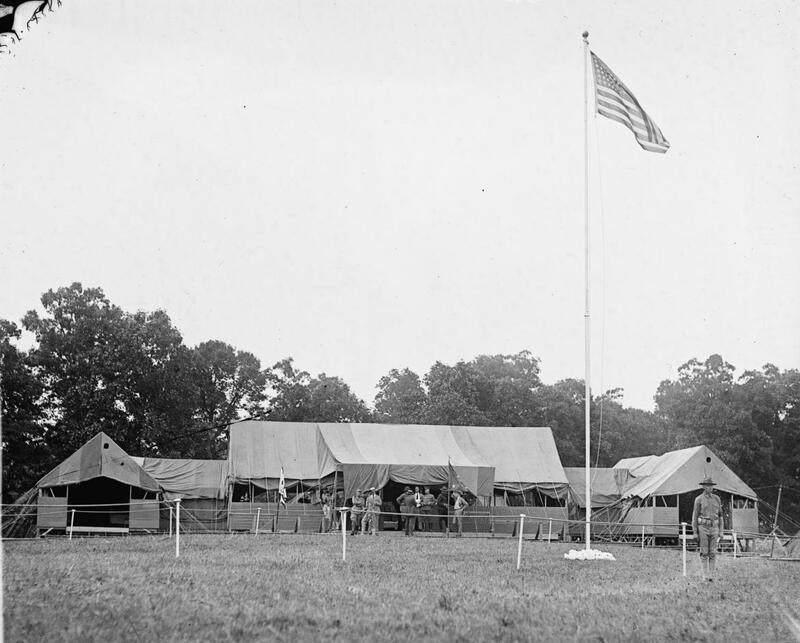 The Marines arrived in Gettysburg and began setting up Camp Harding on Monday, June 26, 1922. This view was taken circa June, 1922. While the Marines were trudging to Gettysburg, President Harding was still in Washington. Here he greets Confederate Veterans and their wives, who had attended a large reunion in Richmond, Virginia, outside the West Wing of the White House. This view was taken facing east on Friday, June 23, 1922. 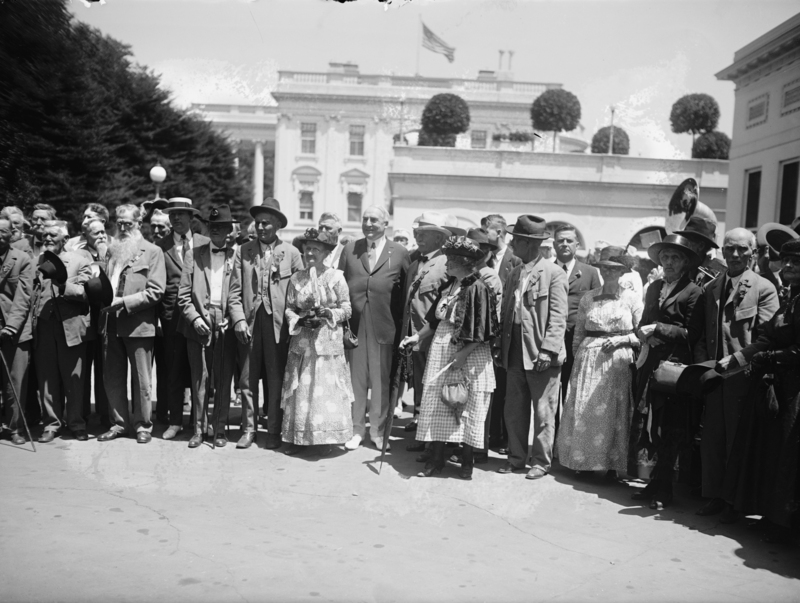 On the morning of July 1, 1922, President and Mrs. Harding were ready to leave for Gettysburg. This photograph shows the vehicles pulling away from the north side of the White House. The New York Times stated, “The 85-mile trip from Washington was made in 3 1/2 hours, part of it in a driving rain. As the Presidential party approached the Pennsylvania State line, cars in the front of the procession stopped to permit General Lejeune and Governor Sproul to welcome the President to the State. An automobile carrying Charles G. Dawes, former Budget Director (editors note: Vice President of the United States under Calvin Coolidge and the son of Rufus Dawes of the 6th Wisconsin Infantry Regiment); Brig. Gen. Sawyer, the President’s physician; Mrs. Dawes and Mrs. Sawyer, was crowded off the road to avoid colliding with an automobile ahead and crashed into a fence. The machhine was not damaged, however, and none of the occupants was injured.” This view was taken facing southwest on the morning of Sunday, July 1, 1922. Before the Eisenhowers established the “Gettysburg White House,” President Harding established his own “White House” at Gettysburg. The Marine camp was named Camp Harding for the occasion. The camp was located between West Confederate Avenue and the Emmitsburg Road. The New York Times article stated, “The President and Mrs. Harding are quartered at the camp at a temporary White House of canvas and wood. The structure is equipped with elaborately fitted sleeping rooms, baths, electric lights and even has a front porch.” The structure contained 16 connected rooms as well as a telephone/radio hookup installed by the Marine Signal Corps to communicate with the rest of the camp. Bell Telephone Company ran a line to the camp so that calls could be made to Washington, D.C., if necessary. This view was taken circa Saturday, July 1, 1922. 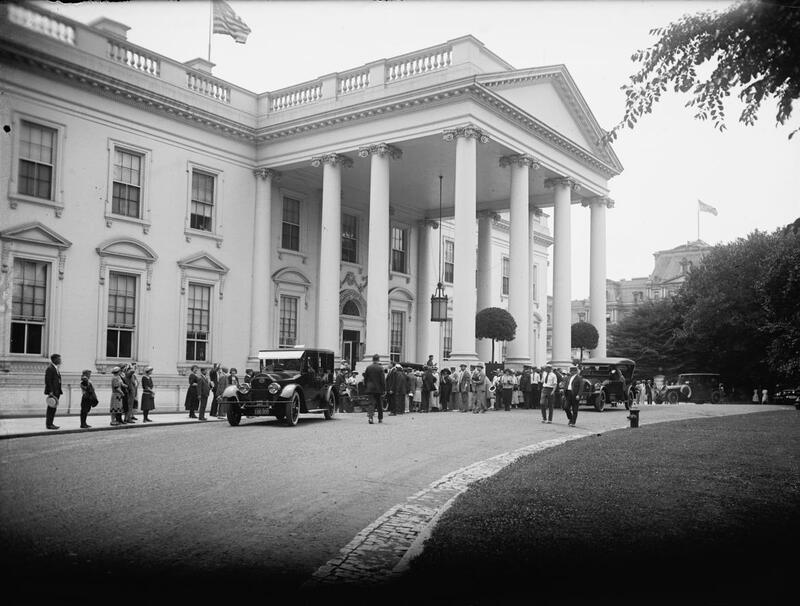 Pictures of Harding and some other important dignitaries were taken on the “front porch” of the “White House.” The person on the far left with the hat in his right hand was William Cameron Sproul (1870-1928) the Governor of Pennsylvania; the next person to the right (Sproul’s left) with his hand on his hip, and in uniform, was General of the Armies John Joseph “Black Jack” Pershing (1860-1948). The next person to the right is unknown, but possibly Mrs. Sproul. The woman in white wearing the mosquito net around her face was the First Lady of the United States, Mrs. Florence Mabel Kling “Flossie” Harding (1860-1924). The First Lady watched the reenactment on July 1st from halfway up the observation tower with her friends, as she did not want to climb the whole way to the top. Next is President Harding. 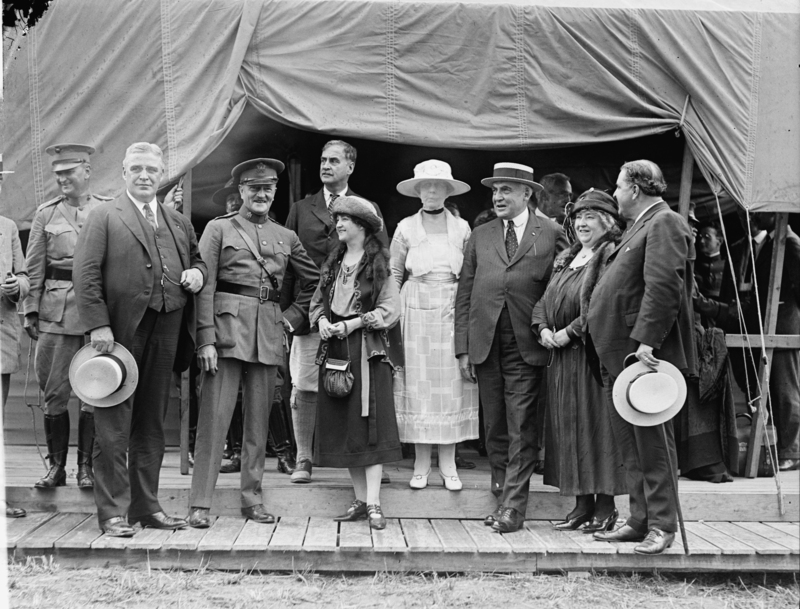 To the right of Harding (his left) is possibly the First Lady of Virginia, Mrs. Trinkle; and the person on the right holding the hat in his left hand was the Governor of Virginia, Elbert Lee Trinkle (1876-1939). This view was taken sometime between July 1-July 2, 1922. This picture includes a couple more figures. The person on the left with the hat on his head is Charles Dawes, future Vice-President of the United States. While living in Lincoln, Nebraska as a young lawyer, Dawes became good friends with the military instructor at the University of Nebraska, John Pershing. 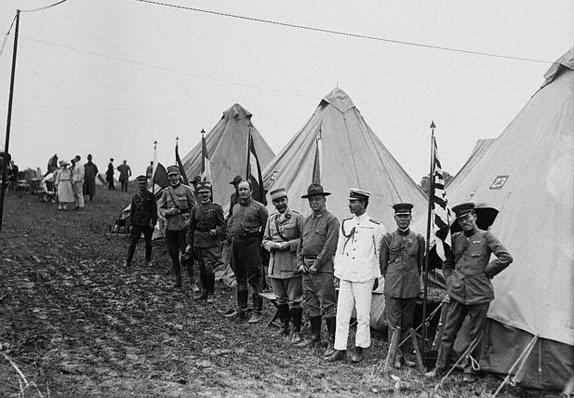 The first person in uniform on the left was Major General and Commandant of the Marine Corps John Archer Lejeune (1867-1942) known as the “greatest of all Leathernecks” and the “Marine’s Marine.” Lejeune served in the Corps for over 40 years and when he retired in 1929 he became Superintendent of the Virginia Military Institute (VMI). Camp Lejeune, North Carolina is named for him. The next person on the right (Lejeune’s left) was Governor Sproul. 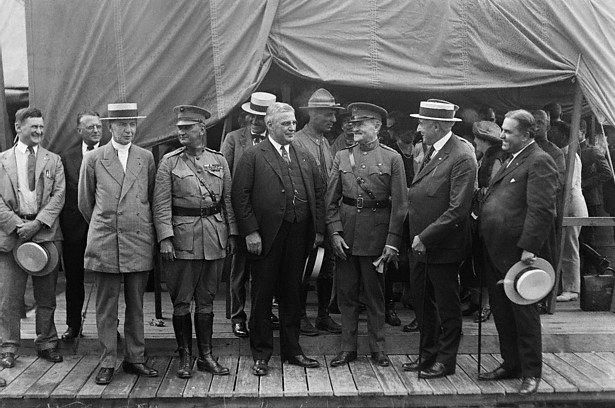 Behind Governor Sproul and between him and General Pershing was Brigadier General Smedley Butler wearing his campaign hat. The rest of the individuals up front from left to right were: General Pershing, President Harding, and Governor Trinkle. This view was taken between July 1-2, 1922. President Harding also took the time to have his photograph taken with some members of the press. Harding had been a newspaper publisher, and that probably helped him get along well with the journalists. Reporters admired his frankness, candor, and his confessed limitations. He took the press behind the scenes and showed them the inner circle of the presidency. Harding, in November 1921, also implemented a policy of taking written questions from reporters during a press conference. This view was taken either July 1st or July 2nd, 1922. The officers also posed with the President as they showed him other locations around the camp. 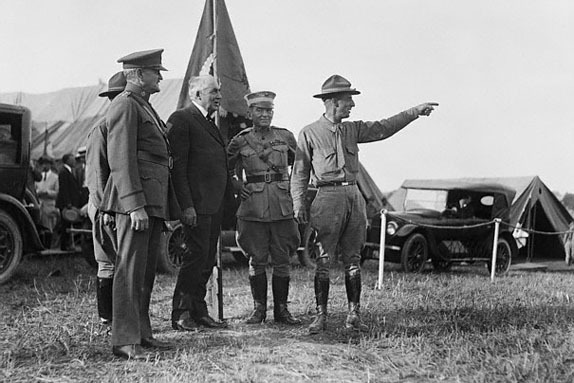 From left to right were: General Pershing, President Harding, Major General Lejeune, and Brigadier General Butler (pointing). This view was taken either July 1st or 2nd, 1922. However, it wasn’t only American military officers watching the Marines at Gettysburg. Military officers from other countries were observing as well. Here they are standing in front of their countries’ flags. The Gettysburg Times reported that guests to the camp included: “Lieutenant Diogenes Morcles, naval attache from the Venezuelan government; Captain H. Graca Aranha, naval attache from the Brazilian government; Captain E. A . Varona, Cuban military attach; Dr. J.B. Hubrecht, Secretary to the Netherlands Legation; and Major Cassimer Mach, Polish military attache.” You will also notice the mud in this photograph. It was raining heavily during the weekend of Harding’s arrival, with a thunderstorm letting up just before the reenactment Saturday afternoon. The rain continued after Harding’s departure, causing the Gettysburg Times to refer to the camp as a “sea of mud” on July 5th, with the men “disheartened and anxious to be on the move.” This view was taken either July 1st or July 2nd, 1922. By the late afternoon of Sunday, July 1st, the President climbed the Ziegler’s Grove/Cemetery Ridge Observation Tower. Joining him on the tower were General Pershing, Major General Lejeune, Brigadier General Butler, and Assistant Secretary of the Navy Theodore Roosevelt Jr. (1887-1944). Theodore Roosevelt Jr. landed on Utah Beach by sea with the U.S. 4th Infantry Division. He died one month later in France, and his actions during D-Day were portrayed by Henry Fonda in the 1962 film, The Longest Day. Others on top of the tower included Speaker of the House of Representatives Frederick H. Gillett (1851-1935) a Republican from Massachusetts, Senator George W. Pepper (1867-1961) from Pennsylvania, Governor Sproul from Pennsylvania, Governor Trinkle from Virginia, and Gettysburg National Military Park Superintendent Emmor B. Cope. This view was taken facing mostly south in 1909. Meade’s Headquarters is on the left. Big Round Top is shown in the right background. This is pretty much the same view as the 1909 panorama but it was taken in 1913. 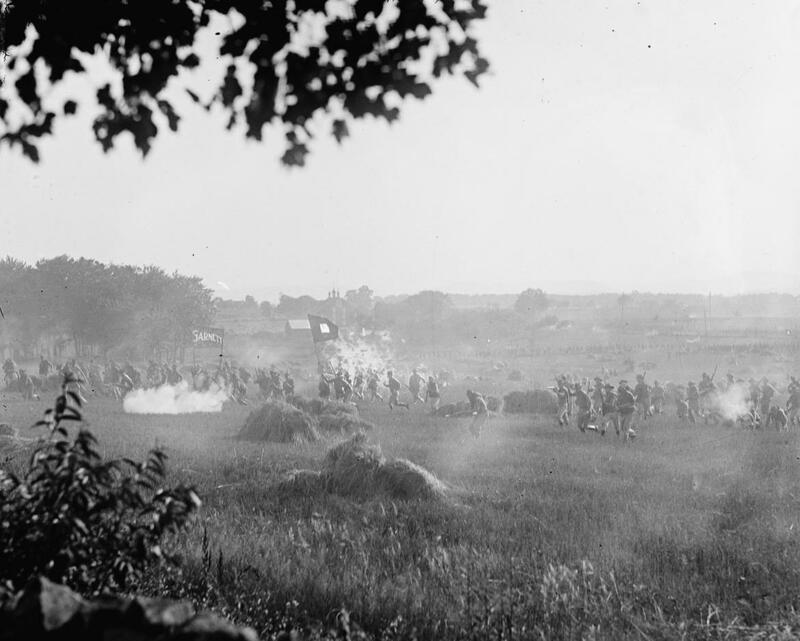 Harding and his group on the Ziegler’s Grove tower would have seen the Marines cross the fields from right to left. The big tent on the right was for the 1913 (50th anniversary of the battle) festivities. 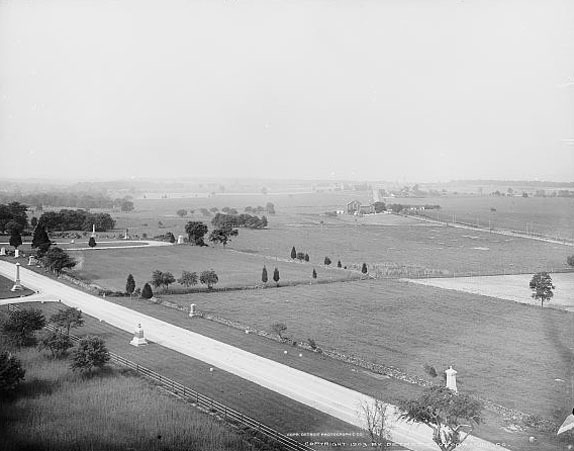 This view was taken facing south to southwest in June, 1913. A better view from the Ziegler’s Grove/Cemetery Ridge Observation Tower of the Pickett’s Charge Fields. The Codori Farm is in the right background along the Emmitsburg Road. Webb Avenue (no longer existing) circles towards the “Angle” of the stone wall. Hancock Avenue is in the foreground. This view was taken facing southwest in 1903. The New York Times continued, “The only criticism that was heard of the exhibition came from F. B. Cope [sic], sergeant of Typographical Engineers with Meade’s headquarters, and now superintendent of the Gettysburg battlefield. When the units representing Armistead’s Kemper’s, Garnett’s, Archer’s, Scales’ and Pettigrew’s brigades reached the stone wall, the height of the charge, and turned slowly back, Mr. Cope, standing on the steps of the observation tower (which Cope designed) on Cemetery Ridge with President Harding, declared the Marines did not retreat fast enough. This may have been criticism, but the Marines accepted it as a compliment.” This view was taken facing south on the afternoon of Saturday, July 1, 1922. Again from the New York Times, “But Mr. Cope showed his enthusiasm over the spectacle when the wavering line broke through the smoke and fell raggedly back toward Spangler’s Woods. 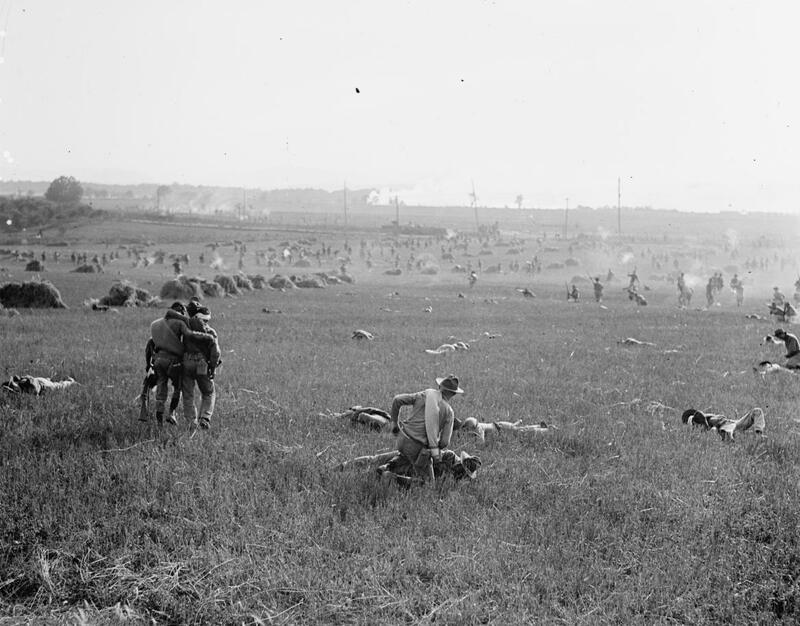 ‘Git Back Thar, he shouted.’ And they did.” You will notice the smoke obscuring Seminary Ridge in the right background. An artillery duel was staged by the Tenth Regiment Field Artillery for half an hour before the advance of the “rebels” was made. The Gettysburg Times reports that this cannonade from the 75mm guns “shook the earth.” This view was taken facing southwest on the afternoon of Saturday, July 1, 1922. The President and Mrs. Harding spent the night of July 1st at Gettysburg and left at noon on July 2nd for their home in Marion, Ohio. They arrived in Marion Monday evening after a 250 mile drive. This was the only time that they visited Marion during his Presidency. This view was taken facing southwest at on the afternoon of Saturday, July 1, 1922. By July 12th, the Hardings and the Marines were back in Washington. Here Mrs. Harding watches the Marines from the grounds of the White House (out of sight on the right) as they march east along Pennsylvania Avenue. This view was taken facing south on Wednesday, July 12, 1922.